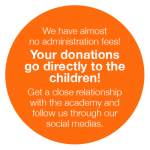 A special thanks goes out to the companies that has donated DKK 5.000,00 or §750 or more to the El Cambio Academy. Below you see these donators. You make a huge impact – Thank you so much for that!